How much effort, skills and resources are needed to Install, Configure, Deploy and Maintain. Include central tools and managed systems, whether it's on-premise or cloud, agent or agentless. Are there Jumpstarts available either as a service or templates/wizards, etc. Do users access via GUI or Web or from anywhere? How various instrumentations and their SAP performance counters are collected. Methods may include agents, webservices, API, native calls, etc. Are the collection methods reliable? Is there self-monitoring of collection status as well as data collection footprint? This is the most basic need in monitoring. How is availability determined and is its definition flexible, such as ping, logon, synthetic, how often, how long, what percentage? Are they static or dynamic (such as standard deviation, averages, min, max, etc)? Is it easy to set and tune, by instance or class or centrally? How is notification of an event or exception handled? Are there flexible definitions of what items or groups, schedule (different for days and time), severity, and are notification targets based on individuals, groups, roles? For known reaction to anticipated events, how are they supported? Is it easy to integrate commands, scripts and can they run cross-platform? What reports are available and how flexible are they to customize or define? Are reports static, or dynamic like dashboards which can be further analyzed? Are data available for download using external reporting? Can reports be scheduled and how are they delivered? Can a definition of service be monitored including applications, groups of systems, users, locations, transactions, business processes, synthetic transactions? Can the service level be managed at different level in the hierarchy with respect to events, weight and impacts? Are monitored service easy to drill-down to find root-cause correlation and further analysis? Can IT operations checklist be automated, as workflows, runbooks, recovery actions with integrated monitor and logging? Are design tools easy to use, deploy and support cross-platform? Some tools are designed just to monitor one type of system, some just to monitor one system, some will provide a handful of functionality but not others. Inevitably, their will be some compromises, but make the best informed one. 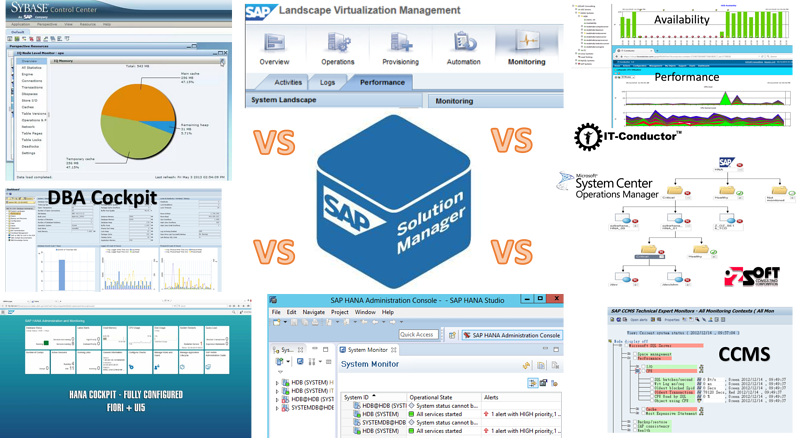 Here are some resources to help get an overview or set up some of the tools available from SAP. Most times, you have to do the research and/or see for yourself before you can assess what's in your shop and out there in the world.